Auxillary switch placement- What have you done? - THE PORTAL HUB - Pinzgauers, Haflingers, Volvo 303s and more! Auxillary switch placement- What have you done? Having done a major body restore on my 1975 710K (past tense used liberally as this is an ongoing project as you all know), I am adding some electrical accessories; front and rear lights, dome lights, radios, etc. I want to put in some rocker switches for these and usb ports. The dash space is tight, almost none. I know many of you have done the same and can offer some ideas about dash locations, overhead or front consoles. I am not sure I can offer any more details on anticipated needs as this is in the idea stage. I have found a few postings on this but unfortunately most of the photos are gone. Please offer some ideas and reposting of photos if you can. Any help is appreciated. Re: Auxillary switch placement- What have you done? Yes, all the old photos that I linked (from Photobucket, of course) are gone, but I can get them replaced - viewtopic.php?f=18&t=6927 had the information about the overhead console that I made for just such needs: floodlights, circuit breakers, GPS, Tire pressure monitoring, GoLight wired remote, digital thermometer (inside and outside temps), and whatever else I may need. 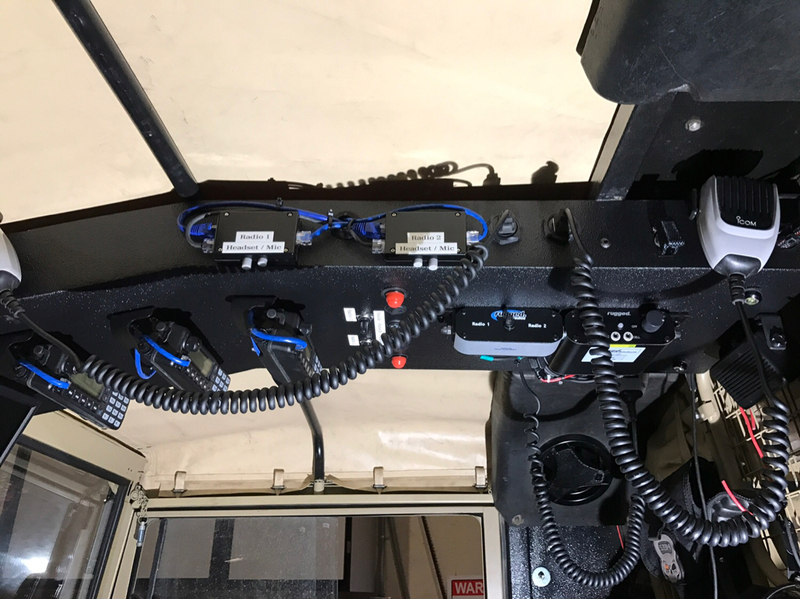 The neatest thing (for me, anyway) is that the overhead console hinges down at the rollbar so it is easy to access the top where all the wires are run. This makes it much simpler to add other features, switches, etc. While I have a fiberglass hard cab roof it would work as well for soft tops, too. Thanks Jim! Looking forward to those pics. You list many of the devices I am considering. I can't believe Jim (pics still pending) is the only one that has put auxiliary switch panels in his truck. Is it something I said? Or, everybody having a great Thanksgiving weekend? Please, show me your ideas. Just a simple molded switch panel (for a Jeep ) and some Carling switches. Thanks Paul, the link is helpful. I like your pod. Everyone, keep the ideas coming! Blame a lack of response on the holiday -- never a lack of interest in responding. As far as a few ideas to consider, in addition to Paul's and Jim's. A couple of quick and dirties...some not so quick. panel somewhat longer to add more switches. It's a bit out of the way but after a bit my fingers seem to find the switches. My CB is mounted behind the drivers seat, I chose a unit that has all the controls built into the MIC -- very convenient. The unit behind the seat is the Transceiver. One other not so obvious place to mount switches and gauges for a hardtop "K" is the space above the door jams. gauges and a Alpine receiver/GPS unit and just ran out of space. Dropping your windshield is out for this approach. radio everything else is rear mounted. The real fun begins with the power delivery and Antenna mounts. I finally updated the images (in the link that I first posted) of the overhead console. Like Ron, I have added an additional switch (for a rotating emergency beacon) to the panel where the emergency flasher switch is located. I also have two circuit breaker switches attached to the left edge of the dash for forward lighting (where they are easy to reach with hands on the wheel) and mounted my HAM radio head on a bracket just above the wiper switch (again, so it is easy to see and reach while driving; same place that Paul has his phone in the photo above). It is best if items that need to be looked at or switched/adjusted while driving be as few as possible, but if required they need to not take your eyes far from the road and not take your hands far (or off, if possible) the wheel. Most switches I arrange and actuate by touch while driving; only the GPS and HAM radio need the occasional glance, and these don't direct my view too far away from the road ahead. I have some switches in a simple, home built, aluminum overhead console. 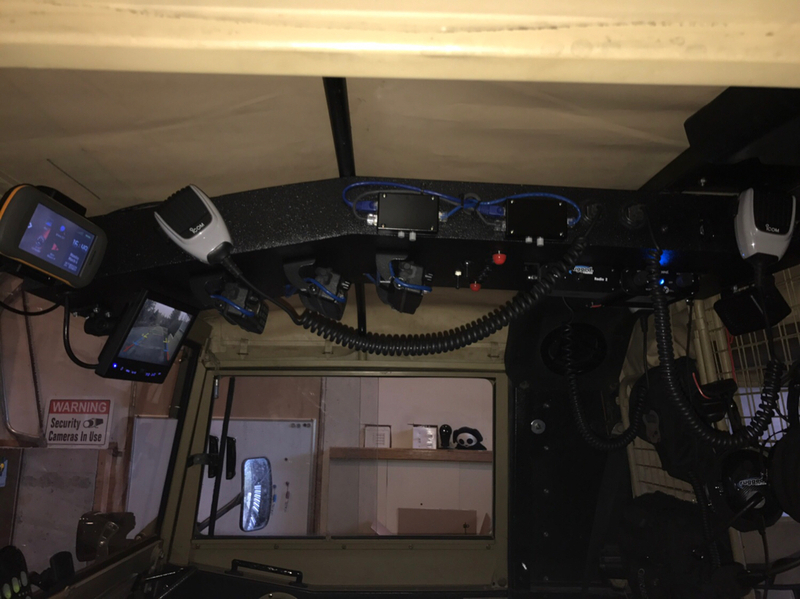 The rest of my switching is through my siren head controller which has 9 programmable buttons in the handheld controller with the main body (Whalen HHS-2200) mounted behind the passenger seat. It’s 12v circuits so when it’s powering a 24v device I have that circuit signal a 24v relay. I don’t have one of the main body on my phone..
brazed? Nice rolled edges, finish looks good too. Wow! thanks guys. Certainly all of these run thew gambit of simple to quite complex. As is my usual manner, I am drawn to the complex overhead consoles. Paul, how does your phone mount, suction, bolt on ? Ron, Do you have a better photo of your overhead console that is partially shown in one of your pics? How is your screen attached to the wiper motor? 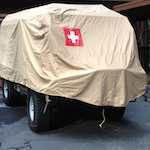 And yes, I plan on putting the radios in the rear, perhaps in a transportable case with the heads up front. Unfortunately I do not have a table but have posted a WTB in an attempt to find one. Andre may have a lead, fingers crossed! Jim, Do you have a photo of the mounted radio head you mention mounted over the wiper switch? And, tell me more about what appears to be an inclinometer in the front. Gadgetphreak, I am envious of your "simple, home built" console. I have seen the videos and will try to get more detail of the construction from them. I agree with Ron that more info on the fabrication/dimensions would be helpful. I am all about not reinventing the wheel. Thanks again, a lot to consider and of course I want it done yesterday. Any more ideas out there? 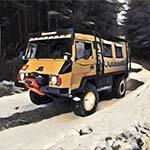 I am wondering if it is possible to put a panel across the front over the sun visors or in place of them. Not sure I really need them given the sitting position in the Pinz, and that I live in Indiana. This is the head as seen from driving position. I can just reach the buttons/knobs while keeping my thumb hooked on the wheel; not only do I still have some connection with the wheel but this helps to stabilize my hand as I reach for buttons. At one time I had the GPS mounted to the top of the wiper bracket; you can see the four holes that I drilled and tapped for the mount. This radio head had a central mounting point, so I bent a bracket to fit and used VHB (very high bond) tape between the bracket and the back of the dash. Hasn't budged in years. The inclinometer is similar to this one: https://www.amazon.com/Lev-O-Gage-Sun-L ... clinometerIt's main purpose was to train my wife not to scream until the ball gets into the red section; by that time I'm puckered so badly that I can't hear her! A quick Google did not turn up any that were color coded like this one I had gotten decades ago but they are probably out there still. whitesik wrote: Paul, how does your phone mount, suction, bolt on ? The mount is from https://thoughtout.biz and I used their self adhesive pad (AdPad 300) to glue the base onto the dash shroud. IIRC, the pad is made from 3M VHB and has held up very well. A better view of my overhead is below, prototype used for the RedBull Pinz'ies -- long story. Alpine unit, and a AFR bar meter for my EFI. Not a simple fab and I don't know who built this. The front display is a simple mount with a ball joint swivel right on the Wiper motor mount. so I can use this as a second display from my MAC Mini for Trails/NAV. GadgetPhreak wrote: I have some switches in a simple, home built, aluminum overhead console. 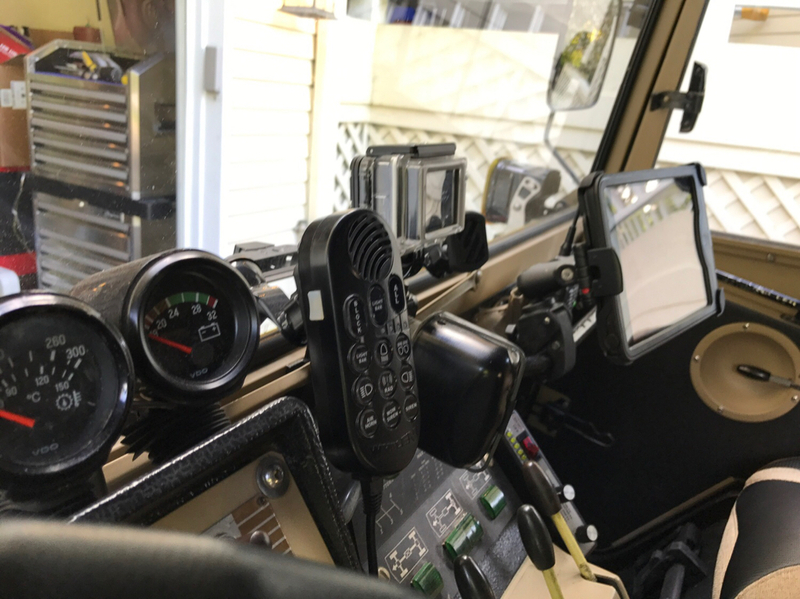 The rest of my switching is through my siren head controller which has 9 programmable buttons in the handheld controller with the main body (Whalen HHS-2200) mounted behind the passenger seat. It’s 12v circuits so when it’s powering a 24v device I have that circuit signal a 24v relay. I thought Mule built all your stuff and someone else did all the insane wiring? Interface. Has most of what is required on 2 screens plus I can adjust things on the fly if needed.